It was inevitable that some hunters would get upset about state game agency actions relative to chronic wasting disease (CWD). You can’t really blame them. In some places, hunters are now being told to shoot lots of does (to slow the spread of CWD), to shoot more yearling bucks (because they disperse and increase the potential spread of CWD), to not use deer urine products, to not use bait, to not put out mineral licks, to not bring home whole deer from out-of-state hunts, etc. To further muddy the water, in recent months we’ve had well-known hunting celebrities and a few outdoor writers telling hunters that the state agencies don’t have a clue about what they’re doing relative to CWD. Some go so far as to say that the game agencies are just plain misrepresenting the truth about CWD. Given all this, I thought it was time to summarize some of the things we definitely, scientifically, know about CWD, and then present some things that we don’t know, and probably will never be able to prove, about CWD. If you have read much of this column over the past 30 years or so, you know that I’m a science guy. Show me the data. Indeed, there is some good provable science on CWD, even though such research is difficult. For example, we know that CWD shortens the life expectancy of deer. A study done from 2005-2007 at Table Mesa, Colorado, showed this for mule deer. Researchers captured, tonsil biopsied, and permanently marked 131 different deer over a two-year period. In 2005, 80 adult deer were captured and tested. In 2006, they captured and tested 79 adult deer, including 44 individuals that were test-negative in 2005. In 2007, they also recaptured and tested 37 surviving individuals that were test-negative in 2006 to determine their final infection status. The results showed that the annual survival of 57 prion-infected adults (over two years of age) was 0.53, while survival of uninfected deer was much higher at 0.82. Estimated average life expectancy for infected deer was only an additional 1.6 years, compared to an additional 5.2 years for uninfected deer. That’s what the data showed way back in 2007. 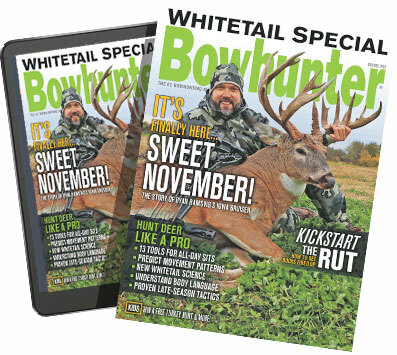 Another study on whitetails was published in 2016. 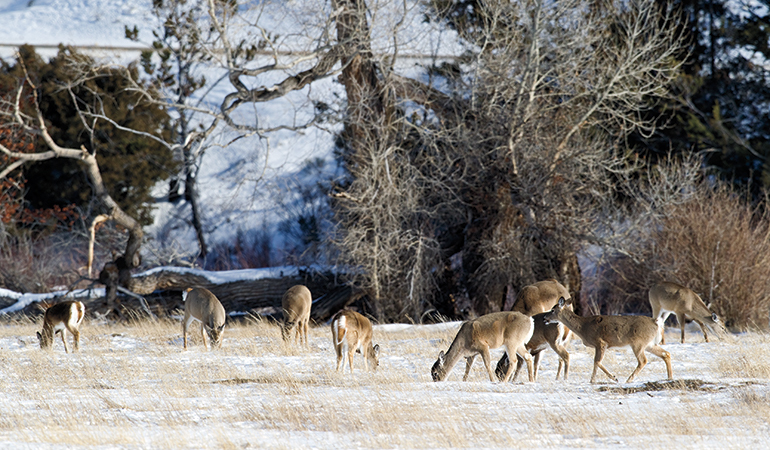 Deer were captured on and around a ranch near Casper, Wyoming. Tonsil biopsies were done, and radio collars were placed on deer. The question this study wanted to answer was: Did a high prevalence of CWD negatively impact whitetail deer population sustainability? The answer was yes. CWD-positive deer were 4.5 times more likely to die each year than CWD-negative deer, and bucks were 1.7 more times likely to die than does. Studies have been done in areas with lots of CWD-positive deer, and over a period of time deer numbers in those areas declined. However, that doesn’t prove that CWD was the cause. But in the two studies mentioned above, tonsil biopsies showed whether deer had CWD or not. In fact, in the one study, they went back the next year and recaptured some of the deer that were proven to be negative and found out how many had become positive over the past year. There are other “provables” relative to CWD, but as critics have recently pointed out, there are things that have not been scientifically “proven.” And those critics then insinuate that agencies are not telling hunters the full truth about CWD. Maybe yes. Maybe no. However, the agencies are between a rock and a hard place. They know how serious this prion disease is. But getting hard data to answer some of the questions is very costly, very difficult, and in my opinion, sometimes not possible. Let me present just one example. If you have CWD in one area, can it be transmitted from one deer to another at mineral sites? I believe it can. As mentioned in my September 2017 column, prions were found at 11 mineral sites on public land in Wisconsin. But, is there scientific proof that deer there got CWD at those mineral sites? How would you set up a study to answer this question? Let’s assume some tonsillar biopsies were done on deer near the mineral sites that showed that some deer had prions. Let’s also assume that soil and water samples were taken from the mineral sites where licking obviously occurred, and many samples tested positive for prions. (Note: such results were found in the Wisconsin public-land study). Let’s also assume that feces were collected in the vicinity of the mineral sites and prions were found. That, too, has already been done in the Wisconsin study. Okay, from the above, there is a fair amount of circumstantial evidence that deer get CWD at mineral sites. Same scenario could be said for bait sites, where feeding deer leave mucous. From lab research we know that there are prions in mucous and body liquids. But does all this circumstantial evidence mean that it has been scientifically proven? No. And here is why it may never happen. In order to prove transmission in the wild, you would have to show there are prions at the site (and that’s been done). You would then have to somehow capture and mark a number of individual deer that feed at bait sites, or lick at mineral sites. The problem here is that some of those deer already have CWD. So, you’d have to capture and mark, and tonsil biopsy a number of deer so you know which deer have CWD, and which do not. Then you have to watch them feed or lick at the sites, then recapture and biopsy them to see if the negative ones got CWD. But this presents another problem. How long does it take for a deer in the wild, that doesn’t have prions but licks them at a bait or mineral site, to become tonsillar-biopsy positive? In other words, a negative-prion deer could lick and get the prions in its body at bait, but when will that show up in a tonsil test? Is it a month, two months, six months? Or is it immediate? If you really want to bend your brain, think about how you’d design a study to find the answer to that in the wild? You’d have to catch and mark and biopsy a ton of deer. Even so, my guess is you can’t answer this last question in the wild. It just can’t be done. But for the sake of argument, let’s assume that all deer that lick prions at mineral sites or bait sites get prions in the tonsils after two months. So, you’d follow each marked deer that was at the bait or mineral site for two months, then recapture them and test for prions. And in order to be statistically significant, you’d need a relatively large sample size. Note, I haven’t even mentioned all the variables you’d have to account for. For example, do the prions transfer better in warm weather, or less in winter? What about the effects of rain? Is it easier for a deer to get prions at bait when it’s raining? What about the age of the deer? What about the health of the deer? For example, what if a deer you first captured was very healthy (as measured by parameters you check when the deer is first captured), but before the buck or doe goes to the bait or mineral site, it gets sick. Does that affect the ability of that deer to get prions? This discussion could go on and on, and it relates to many “lack of hard science” questions that the state agencies have to deal with. For example, does deer urine from wild deer cause high infection rates in an area? And does deer urine used by hunters transfer prions to healthy deer? The questions are endless, and the truth is that some can be answered, but it will take a lot of research dollars that states do not have. And even if the money was there, some questions can never fully be answered. We’ve learned that from mad cow disease, Creutzfeldt-Jakob disease, and other prion diseases. My thoughts are pretty basic. Prion diseases are bad. From the scientific data we do have, the impacts of CWD on wild deer can be very bad. Agencies are in a struggle to deal with CWD, and they sometimes have to pile up the circumstantial evidence and make management decisions. You can scream for “proof” all you want, and it may never be there. At least not in the wild. Until the federal government comes through with major research dollars, it will be a struggle, and agencies will do whatever they feel will slow the spread. But down the road, long after I’m gone, CWD will be everywhere. Then what? I don’t have answers. No one does. So, as a bowhunter, I’ll climb into my treestand and enjoy my hunt, all while obeying every state regulation put in place that is intended to slow the spread of CWD.